Cream cheese guilt is real. I know; I’ve been there. These days, I am not into food guilt. In fact, I think it’s the devil. It comes from food fear, which comes from food ignorance, and what better way is there to cultivate a dysfunctional relationship than to cultivate ignorance, fear, and guilt? Like I said, though, I have been there, and for those of you still in this struggle and wanting to stop it, already, I say baby steps are the way to go. I offer up the recipe below as a baby step. It’s not exactly the same as cream cheese, because it isn’t made with the same culture, but it’s very similar, and made with yogurt so it’s full of live, active cultures. It’s a veritable probiotic schmear on your bagel, and much more tasty than any capsule you could take. Use it just as you’d use cream cheese – liberally – and feel good and healthy about it. Step one: Acquire some plain yogurt. The full-fat stuff. Step two: Hang the yogurt over a bowl in a double layer of cheesecloth or a thin dish towel. 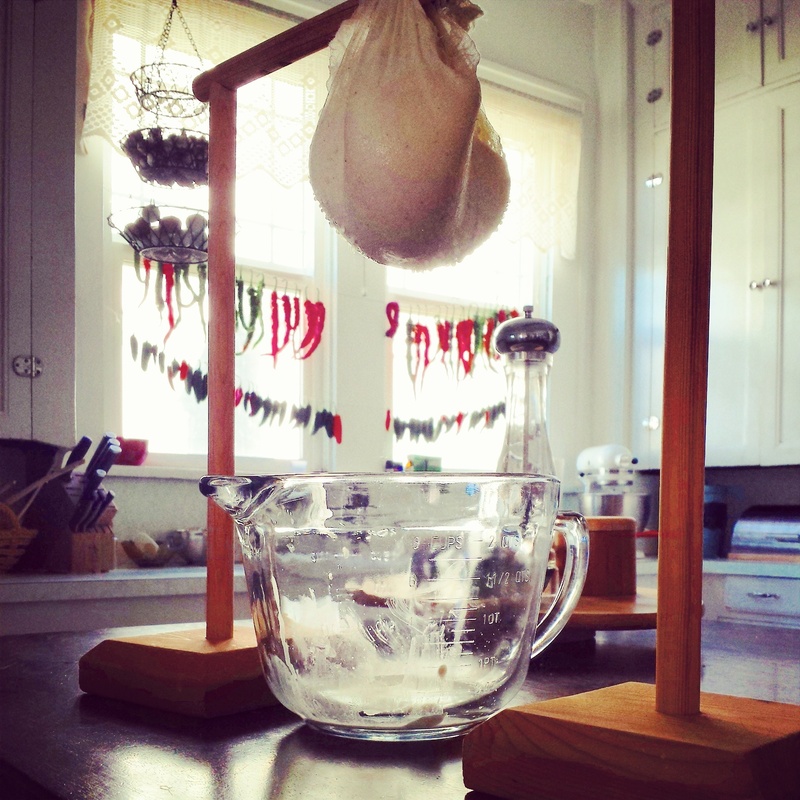 I use this lovely contraption Joseph built for me (I use it for ricotta, too), but you can use a jelly strainer, or line a colander with cheesecloth and set it over a bowl. It’s not Christmas. Those are hot peppers turning red in the background. Step three: Let the yogurt drain its whey until it reaches your desired level of thickness. Step four: Eat some cheese! 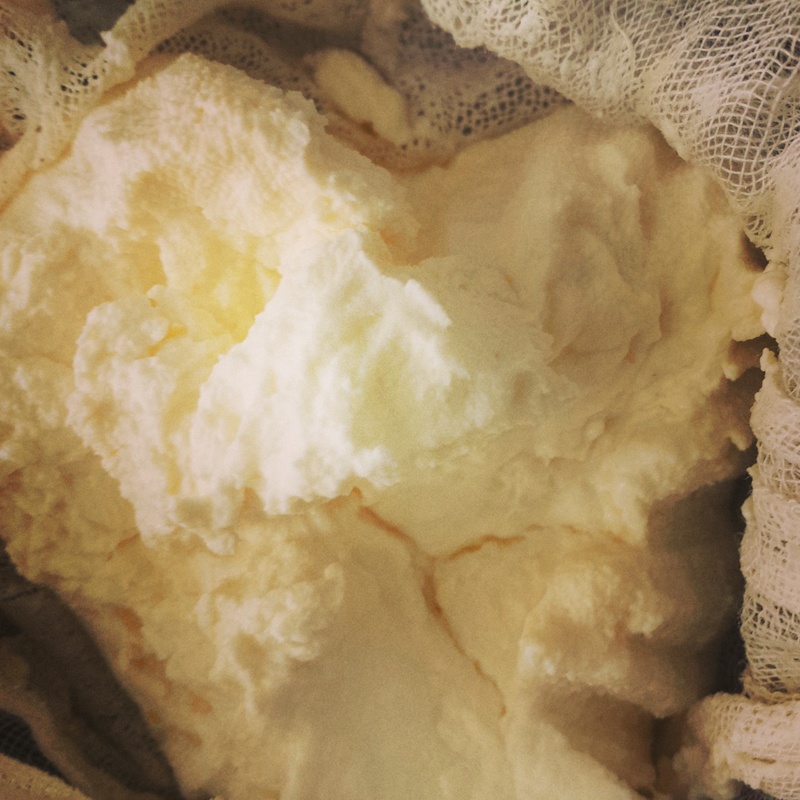 The cheesecloth is pretty and artsy; I always hate to transfer the cheese to a plastic tub. Though today was a sweaty 90 degrees, autumn and the holiday months are coming up quickly. It’s nice knowing all the warm and hearty dishes concocted in my household, like butternut squash soup and a more nutritious version of the best Starbucks treat of them all (the cranberry bliss bar), will contribute to our good health partially because we swirl in this yogurt cheese. Some day I’ll teach you to make and love and not feel guilty about REAL cream cheese. But baby steps. 21 Sep	This entry was published on September 21, 2014 at 5:28 am. It’s filed under Collection and tagged cheesecloth, cream cheese, cream cheese recipe, DIY, food guilt, guilt-free, holiday food, homemade, labneh, labneh recipe, yogurt cheese, yogurt cheese recipe. Bookmark the permalink. Follow any comments here with the RSS feed for this post.